Disaster preparedness is one of the things that the government asks the public to take interest in. With devastating storms and all kinds of natural disasters come and go, one does not know when things go bad and you simply have to be prepared for the worst. On that note, DIY survival gear would be one of the practical things to have in hand. If you have a DIY survival gear with your person, you will have a good chance of survival wherever you are at times of distress. 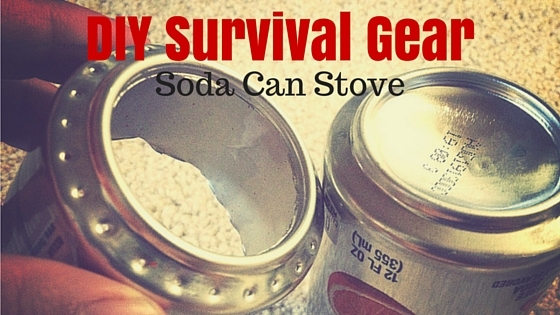 Among your DIY survival gear, a soda can stove would be really great. While the government foster that you bring ready to eat foods, there is no telling when will your food rations will run out and if you do not have kitchen utensils to cook, then a do-it-yourself soda can stove would be real handy for you. At times of emergency, you would most certainly prefer to bring things that are lightweight and would not take up much space. In that case, a soda can stove would be perfect for your DIY survival gear. Your project for your DIY survival gear is building a soda can stove that is made of aluminum cans. It has to be made strong and reliable. As much as possible, it has to be lightweight, burns alcohol as fuels and costs next to nothing. With the soda can stove, it makes it possible for you to have a campfire anywhere you are even when the dirt is damp through a stove that weights just about 10 to 15 grams and costs you nothing. There are a few things which you will need in making the soda can stove. These things are heavy-duty scissors, heavy-duty blade, an ice pick or scratch awl, at least 2 clean soda cans, 3 nails about 7 cm long, high temperature tape like foil tape or aluminum tape, battery, ruler and marking pen. As you can see, most of these materials are probably just lying around your place. The only thing that you might find hard to find is the high temperature tape but you can still buy them at the nearest hardware store from your house. There are some people that claim that the Pepsi can is a much better option compared to others. But basically, you can use any kind of soda cans to create your soda can stove for your DIY survival gear. After drawing the cutting line, you can proceed first to creating the burner holes to make it all simple. You can simply do so by poking holes down the bottom edge of your soda can with the use of an ice pick or a scratch awl. As for the holes, there are some that say smaller are fuel efficient while bigger holes burn hotter. Just think of what you want but make sure that holes goes around the rim as even as possible. Next step is creating your soda can stove’s main opening. In doing so, cut the very bottom of the can where the holes were poked in. You can use a heavy-duty blade to do this and be very careful especially since it is the part of the soda can that is especially thick. If the edges of the can turn out jagged, you can just file it now or later it doesn’t really matter. The stove stop is the next you will have to take care. Cut from about ¾ inches from the can’s bottom. That will be the top part of your soda can stove. So that you can create an even cut of the stove top, one good technique would be to first create rough cut to separate it from the can and then a second cut to even it out. Once you have already cut out the stove top, snip its edges a number of times in order to create tabs. These tabs are needed so that when the stove top will be fitted to the bottom, it will properly fit. There is a reason why you need at least 2 cans and that is because you need to cut another bottom. This time, you don’t have to poke holes in it and you have to cut it from about 1 inch from the bottom. Of course, you can cut it a bit taller if you want a stove that is taller. Now it is time to create an inner wall using the leftover of the cans if they were not too mangled. If they are, then you will need another can and cut out a strip of about 1 1/3 inches wide from it. After cutting the strip of the inner wall, cut halfway on each end as these are where the ends will be locked together. When locking the ends, make sure that they are within the loop. In order for the fuel to be able to flow from the inner wall through the outer wall, cutting small bits off its ends about equal distance with each other will help. It also saves you a bit of weight so your soda can stove will be a bit more lightweight. The second to last step of course is to put the parts together. You can start by putting the inner wall within the stove bottom. The notched ends should be down and then next is for you to fit the top of the stove while tucking the snipped ends within of the stove bottom. Lastly, when all the parts have all been successfully pieced together, secure them in place using a high temperature tape. Wrap them around your soda can stove and make sure that the top and bottom are pieced together. Now your DIY survival gear soda can stove is finally done and you can now use it to cook over it. It will be good if you can also build a pot support and alcohol can be used to as your fuel. Enjoy! !